With four USB ports, this travel power hub can recharge a phone, a tablet, a GPS unit and a wireless headset, all at the same time! 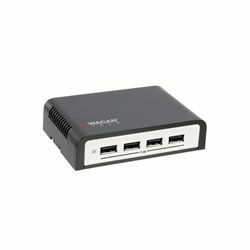 It provides up to 2.4 amps per port, enough to quickly charge four full-sized tablets simultaneously. To insure it doesn't overdo it, the Quad Power Hub includes low-voltage shut-off, overheat protection and short-circuit protection. Includes mounting hardware. AC adapter sold separately.